Tryckeriet skickar fulltext-PDF på godkänd avhandling eller uppsats till MDH:s högskolebibliotek för registrering i DiVA. tryckerisamordnare, Erika Johansson, för distribution till högskolebiblioteken och ledningskansliet. Läs igenom texten noga innan du lämnar in dina filer. 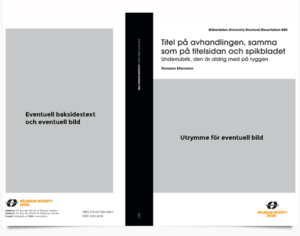 Provtrycket och PDF-korrekturer är till för att säkerställa en hög bildkvalitet och korrekt placering av text – inte rätta till stavfel, det arbetet ska redan vara klart. 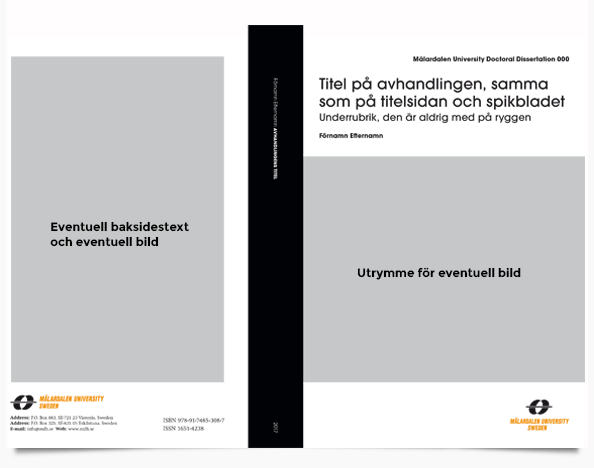 Filformatet för tryckoriginalet ska vara PDF. Bilderna bör ha en upplösning på minst 200 dpi. Vi kan även hjälpa er med visitkort, brevpapper, kuvert, foldrar, vykort, produktblad, böcker, rapporter, flyers, affischer och roll-up. 1- You should send in your printable thesis/report as a PDF file(s). Remember also to send in the library pages, which should also be in PDF format. Email all your PDF files direct to info@eprint.se. 2- You will receive a PDF proof for preview from E-Print. 3- If you need to make changes after the PDF proof you should email the whole thesis/document to E-Print again. Please remember to state your order number. In case of changes you will receive a new PDF proof. 4- When the PDF proof has been approved you will receive a hard copy proof at your delivery address. Please inform us if would rather collect your hard copy proof at E-Print on Oxtorgsgatan 9-11 in Stockholm. 5- When you have checked your trial print and are satisfied with it, contact E-Print to start the printing process. Now it will take about five working days until the edition is delivered to MDH. The printers will send a full-text PDF of the approved thesis or dissertation to MDH’s University Library for registration in DiVA, the Student Records.The printers will send seven deposit copies to the deposit libraries and seven copies of the thesis or dissertation to MDH’s Printing Coordinator Erika Johansson for distribution to the University Libraries and the Management Office. Read through the text thoroughly before handing in your files. The hard copy proof and the PDF proof have the purpose of assuring high quality of the pictures and correct placing of the text – not of correcting spelling mistakes; this work should have been done already. Be careful to check that all the pages are there, the library pages, articles, the introductory chapter of a compilation thesis and other appendices. The file format for the manuscript must be a PDF. The pictures should have a resolution of at least 200 dpi.